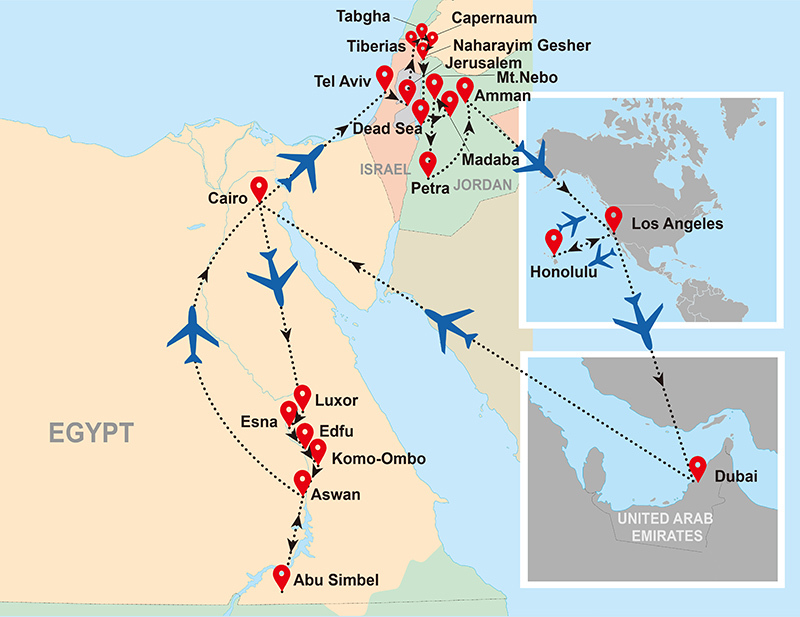 Today we will fly from Los Angeles via Dubai to Cairo, the capital and largest city of Egypt. Overnight onboard. Upon arrival at Dubai, we will transfer to a flight to Cairo. Our tour guide will meet us at Cairo International Airport and assist us as we transfer to our hotel. The city’s metropolitan area is the largest in the Middle East and the Arab world. It is associated with ancient Egypt and has been a UNESCO World Heritage Site since 1979. 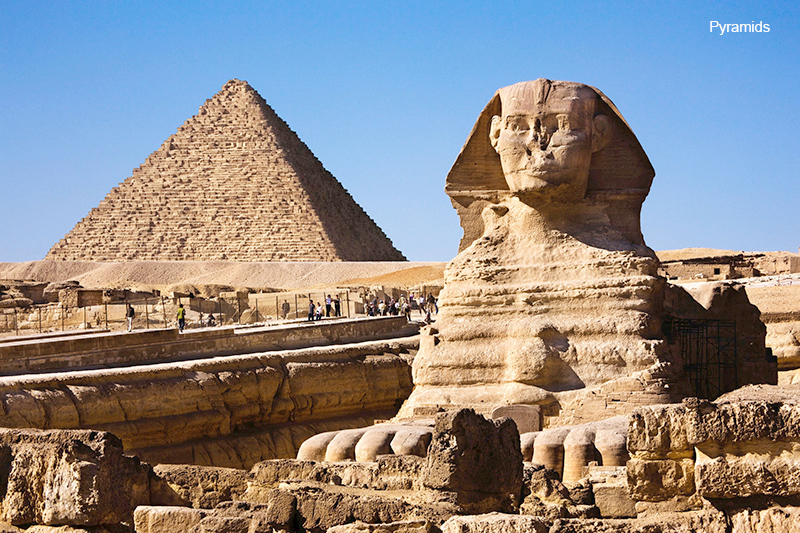 The highlight for today is the Great Sphinx of Giza, the iconic image of Egypt that is a statue of a reclining lion with a human head that stands on the Giza Plateau. We will also visit three famous pyramids: the Great Pyramid of Khufu (Cheops), the last surviving representative of the Seven Wonders of the Ancient World; the Pyramid of Khafre (Chephren), slightly smaller than the Great Pyramid; and the Pyramid of Menkaure (Mycerinus), the smallest of the Giza Pyramids. We will stop by the Step Pyramid, considered to be the earliest large-scale stone construction, and located in Sakkara with a huge cemetery and active burial ground nearby. After that, we will proceed to another important historical site, Memphis, the capital of ancient Egypt. After dinner, we will return to our hotel. After breakfast, we will transfer to Cairo Airport for our flight to Luxor. 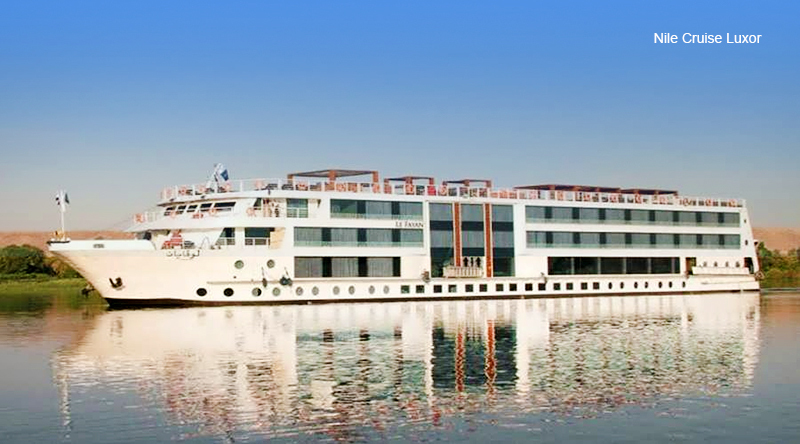 Upon arrival, we will transfer and board a Nile Cruise to Aswan and enjoy lunch on board. Visits of the East Bank include the Temple of Karnak & the Temple of Luxor, an impressive complex of buildings dedicated to the Egyptian Pharaohs. Both temples have been UNESCO World Heritage Sites since 1979. Transfer back to the cruise for dinner and overnight on board in Luxor. After breakfast, we will visit the West Bank, one of the most stunning landscapes in Egypt. We will enjoy our half day tour that includes the Colossi of Memnon, two 18 meters high massive stone statues of the Pharaoh Amenhotep III, who reigned in Egypt during Dynasty XVIII. The limestone cliff-cut Temple of Hatshepsut at Deir el-Bahari, is a complex of mortuary temples and tombs. It has been a UNESCO World Heritage Site since 1979. The Valley of Kings is the home to the tombs of ancient Egyptian Kings. Later in the day, we will sail to the farming town of Esna. This morning, we will continue to Edfu to visit the Temple of Edfu, one of Egypt’s best preserved relics dedicated to the god Horus. Then we will sail to Kom-Ombo to visit the (double) Temple of Kom-Ombo, dedicated to the gods Sobek and Haroeris. 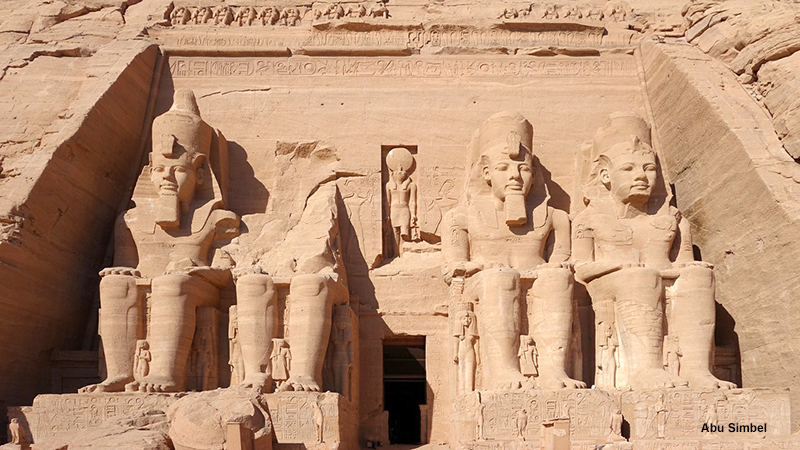 Today, we will have an early morning excursion to Abu Simbel, where giant temples await inspection. Abu Simbel Temples are two massive rock temples in Nubia, located in southern Egypt on the western bank of Lake Nasser. It is part of the UNESCO World Heritage Site known as the “Nubian Monuments,” which run from Abu Simbel downriver to Philae (near Aswan). On the return to Aswan, Lunch Boxes will be provided. Then, we will return to the ship for dinner. The Nile River Cruise adventure will end today. Before we disembark, we will take a motorized felucca tour around this area. From the felucca boat, we will view the once-central Elephantine Island, Kitchener’s Island, the Botanical Gardens and then get a glimpse of the pink granite Mausoleum of Aga Khan, a 20th century wealthy leader of a Shi’ite sect. After that, we will return to the cruise for lunch. Then we will disembark and head to Aswan Airport for our afternoon flight to Cairo. Upon arrival at Cairo Airport we will transfer to our hotel for check-in, and enjoy our dinner at the hotel. After breakfast, we will enjoy a full day of sightseeing in Cairo. First, we will visit the famous Egyptian Museum, home to an extensive collection of more than 100,000 ancient Egyptian antiquities. Besides seeing many of these antiquities, we will also enter the Mummy Room in the museum. After that, we will visit the Saladin Citadel of Cairo, a medieval Islamic fortification and The Alabaster Mosque of Mohamed Ali, one of the landmarks and tourist attractions of Cairo and one of the first structures to be seen when approaching the city from any direction. After lunch, we will visit the Old Bazaar of Khan el Khalili for shopping. It is a major souk in the historic center of Islamic Cairo. The bazaar district is one of Cairo’s main attractions for tourists and Egyptians alike. After that, we will go to Mall of Egypt, a super-regional mall of 165,000 square meters that dominates the western half of the greater Cairo metropolis. We can enjoy our dinner here on our own. After breakfast, we will transfer to Cairo Airport for our flight to Ben Gurion International Airport, the main international airport of Israel and the busiest airport in the country. Israel, officially the State of Israel, is a country in Western Asia, located on the southeastern shore of the Mediterranean Sea and the northern shore of the Red Sea. 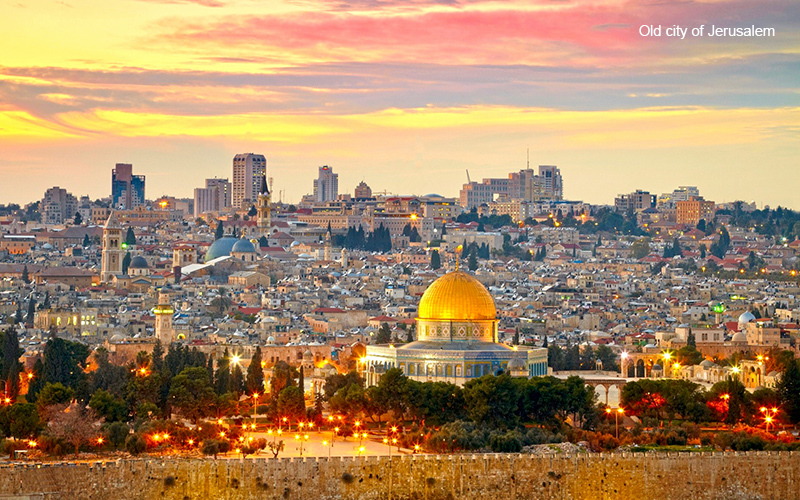 Tonight, we will transfer to our hotel in Jerusalem, the proclaimed capital in Israel. After breakfast, we will visit the old city of Jerusalem starting with a breathtaking view of the city from the Mount of Olives. We will see the Churches of Pater Noster and Dominus Flevit, the Garden of Gethsemani, and enter the walled city through the Lion’s Gate. Our next stop is the Basilica of St. Anne, the western wall known as the Wailing Wall, the Cross Stations via Dolorosa, the holy Sepulchre, the Roman Cardo and the Jewish quarter. If time permits, we will visit Mt. Zion and see the Dormition Abbey, King David’s tomb and the Last Supper Room. Return to the hotel for dinner. The highlight for today is to visit Ein Karem, the birthplace of St. John the Baptist. We will visit the Church of Visitation and Church of St. John the Baptist, and the Yad Vashem Memorial Museum (dedicated to the Holocaust and its victims). Our visit to the new city of Jerusalem includes Israel Museum where you can see an exhibit of the Dead Sea scrolls housed in a special wing called “the Shrine of the Book” and a model of Jerusalem from Jesus’ time. We proceed to Bethlehem and visit the Basilica of Nativity and View of Shepherd’s Fields before returning to Jerusalem. After breakfast, we will visit Caesarea, an ancient Roman capital that had a lot to do with Christianity. Next, we proceed to the third largest city in the country, Haifa and see The Stella Maris Monastery, a19th-century Carmelite monastery located on the slopes of Mount Carmel of Israel. After that, we will visit the oldest continuously inhabited sites in Israel, Akko (designated by UNESCO as a World Heritage Site in 1990). We will arrive in Tiberias and spend the night here. After breakfast, enjoy a boat ride on the Sea of Galilee and see the ancient boat from the time of Jesus that was dredged up from the Sea of Galilee. Next, we will visit ancient Magdala, one of the most exciting discoveries in recent years related to the life of Jesus, followed by the Mount of Beatitudes, where Jesus delivered the Sermon on the Mount. After that, we will drive to the Golan Heights, a territory controlled by Israel since 1967, but also claimed by Syria. Next, we will visit Banias Nature Reserve, a national park with many scenic trails, springs, and waterfalls. At the end of the day, we will have some local wine tasting at a Golan Heights winery before returning to the hotel for another night. In the morning, before we transfer to Amman, the capital and largest city of Hashemite Kingdom of Jordan, we will visit Capernaum and the Tabgha, the traditional site of the miracle of the loaves and fishes (and the third resurrection of Jesus in Christianity). Next, we will visit the Naharayim Experience at Gesher, with a guided tour that includes the Naharayim Experience exhibition, Old Gesher presentation, an underground bunker, crossing the border fence, descent to the banks of the Jordan River, the three Jordan River bridges, and the Mamluk Inn. Hear about the Israeli Phenomenon known as the kibbutz collective settlement, the changes it has undergone throughout the years, and the special cooperation between Gesher and Jordan, its neighbor across the border. At noon, we will transfer to Sheikh Hussein Bridge to cross into Jordan. The drive takes about 3 hours. Upon arrival, we will transfer to our hotel along the Dead Sea. Dinner will be served at the hotel. After breakfast, you can relax or enjoy the Dead Sea Beach, the lowest point on earth, 1,412 feet below sea level and float in its warm, salty waters. Afterward, we will go to Mt. Nebo, considered to be one of the most important holy sites in Jordan. This is the place where Moses climbed from the Valley of Moab, where God showed him the Promised Land, and Moses’ last resting place. After lunch, we will visit the Christian Town of Madaba, “The City of Mosaics”. We will also visit St. George Greek Orthodox Church, where we will see the mosaic masterpiece of Madaba. Archaeological Park houses the remains of several Byzantine churches, including the amazing mosaics of the Church of the Virgin. 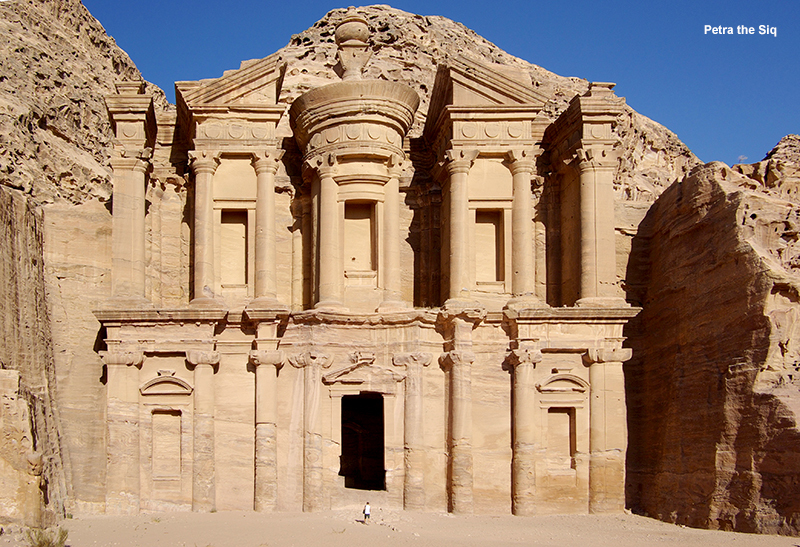 Then, we will transfer to Petra, a historical and archaeological city in southern Jordan. It has been a UNESCO World Heritage Site since 1985. UNESCO has described it as “one of the most precious cultural properties of man’s cultural heritage”. Dinner will be arranged at the hotel. After breakfast, we will visit the ancient Nabatean Capital, Petra, the fabled “rose red city, half as old as time”. The fun starts with horseback riding, followed by a walk through the Siq, a long narrow fissure between two overhanging cliffs. Towards the end of the Siq, we will be spellbound by Petra’s most famous monument, The Treasury. It is one of the most elaborate temples in the ancient Arab Nabatean Kingdom city of Petra. As with most of the other buildings in this ancient town, including the Monastery, this structure was carved out of a sandstone rock face. We will return to our hotel after the full day visit in Petra. Dinner will be served at the hotel. Today, we will drive back to Amman, and enjoy a city tour in Amman. First, we will visit the Ruins of the Amman Roman Theatre, a famous landmark in the Jordanian capital that dates back to the Roman period when the city was known as Philadelphia. The theater, constructed during the reign of Antonius Pius (138-161 AD), could seat about 6,000 people. The large and steeply raked structure was built into the hillside; it was oriented north to keep the sun off the spectators. After that, we will visit the Archaeological and Folklore Museums. The Archaeological Museum houses artifacts from all the archaeological sites in the country while the Folklore Museum, houses items representing Jordanian cultures. After lunch, we will visit the Citadel and the Umayyad Palace, a historical site at the center of downtown Amman and large palatial complex from the Umayyad period. After dinner, we will transfer to the airport and board the flight back to Los Angeles. *** Depart to airport at 10:00PM. Our flight leaves at 1:45 AM midnight on Dec.06th. *** Hotel room is reserved for tonight, so we can have a refreshment in the hotel room before we transfer to the airport. Our flight to Los Angeles leaves after midnight. We will do a transit at Dubai Airport. Upon arrival at LAX, proceed to immigration and customs. We will take the shuttle bus to our hotel. We will take a flight back to Honolulu, taking home lasting memories of a magnificent Road to the Pyramids adventure. ** From September 27, 2019 to departure or withdrawal during the tour shall be regarded as willingly giving up all rights concerned, 100% of the total price, and the request for other service as substitute shall not be accepted.